Be the first to share your favorite memory, photo or story of Herbert . This memorial page is dedicated for family, friends and future generations to celebrate the life of their loved one. 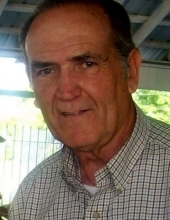 Herbert Ray Batson passed away February 6th 2019 in Nampa Idaho. He was “Ray” to his family and friends. He was born to Myrtle Batson and John Herman Batson, February 13, 1933 in Blossom Texas. He was the oldest of 4 children. Ray grew up in Texas, right after the great depression and times were hard. His father left and Ray worked to take care of his mother and siblings. He loved his family and his aunt Velma who was like a second mother to him and helped him to attend Bible College. She would give him a quarter a couple times of year to buy a moon pie an RC and peanuts. It was one of his favorite things to do. After college he was drafted and served 2 years as a medic in the Korean war. He got to see a lot of Europe and loved to travel. After he got back, he became a travelling preacher. One day in 1963 he preached at a little church in Sikes, Louisiana where 18 year old Lynn Parker was attending. Her family invited him for dinner and a year later they were married in Dallas Texas, on January 21, 1964. They lived in Oregon, Wyoming and moved back to Texas for many years where he worked as a supervisor at the Dallas Post Office. They had 3 children: Myla, Derrek and Christal. In 1976 they decided to move to Nampa Idaho, He worked for the Boise Post Office until he retired in 1991. At 58 years old he decided to buy some Acreage and for the next 2 years he build a 3 bedroom house. What he didn't know he learned and figured out, he was a very smart, capable man. They lived at their place on Airport Road for 25 years, where they raised 3 of their grandchildren. He enjoyed horses and dogs. Ray enjoyed feeding the quail that made his pasture their home. He loved playing guitar, and in another life, free of responsibilities, he would have devoted his life to playing music maybe with Chet Atkins. He had a beautiful voice and later in life loved playing with a local band, for nursing homes and senior centers. He loved God and his church. He attended Valley Pentecostal church for years, and gave his time and money to many people in need. He loved Idaho and spent most summers back packing and camping in the mountains. Bull Trout lake and Sage Hen reservoir were some of his favorites to fish in. He loved hunting and brought home many deer and elk, and a lot of good hunting stories to go with them. He loved to travel. He had an old van and we would load it up with gear and dogs and kids and take off. He had endless energy and a zest for life. He loved his family; that was Ray Batson. If you needed a ride or money or prayer he was your first call. If you needed encouragement or someone to talk to he was there. He had the heart of a Husband and father. He loved his wife Lynn and they laughed and lived together for 55 years. They were an incredible example of faithfulness and loyalty and devotion. He had 7 grandchildren: Danaya, Trechor, Sierra, Stasha, Spencer, Teagan and Devon. Each have special memories of him as they grew up. He was always there for them. He wanted them to love God and each other. Ray lived life fully. He loved his family and they loved him. He was a truly good man. I know when he finally reached heaven’s shores ,God said, "well done good and faithful servant, welcome home." "Email Address" would like to share the life celebration of Herbert "Ray" Batson. Click on the "link" to go to share a favorite memory or leave a condolence message for the family.